Pacing leads have come a remarkable journey…..now only to be threatened by lead-less pacemakers ! Conventionally in electrical diagrams, current is said to flow from (+) pole of a battery to the (-) pole i.e. positive to negative. However, it is now known that an electrical current consists of a stream of electrons and electrons leave the battery at its negative pole. To further confuse matters, we have a cathode and an anode which also says something about the electrical flow. The cathode denotes the pole where electrons are received and the anode is the pole where electrons are emitted. Hence a conventionally positive pole of a discharging battery would its cathode (i.e. electrons come in )! 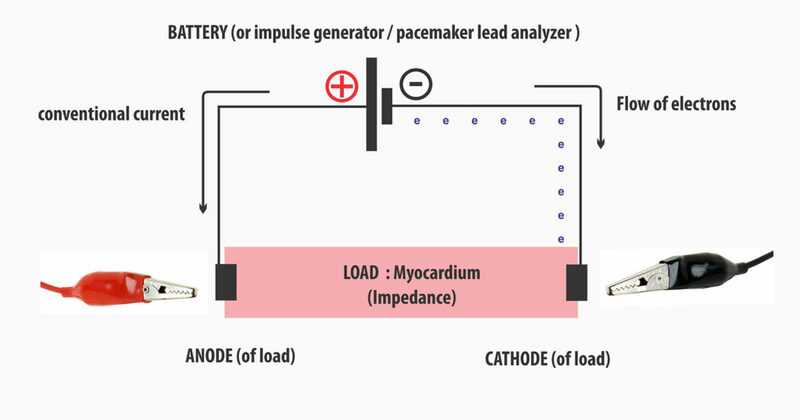 The modern pacemaker leads are bipolar leads : they consists of two electrical channels encased in an insulating material. One channel conducts the electrical impulse towards the lead tip and the other channel completes the circuit back to the pacemaker. In older systems, the lead consisted only of one channel which would deliver the impulse and the circuit is completed by the chest wall tissues which are in in contact with the pacemaker body (metal can) – this was referred to as unipolar pacing. Figure : Bipolar and Unipolar pacing. PPM = Pacemaker. Note cathodal stimulation as shown by entry of electrons to the myocardium at the cathode. 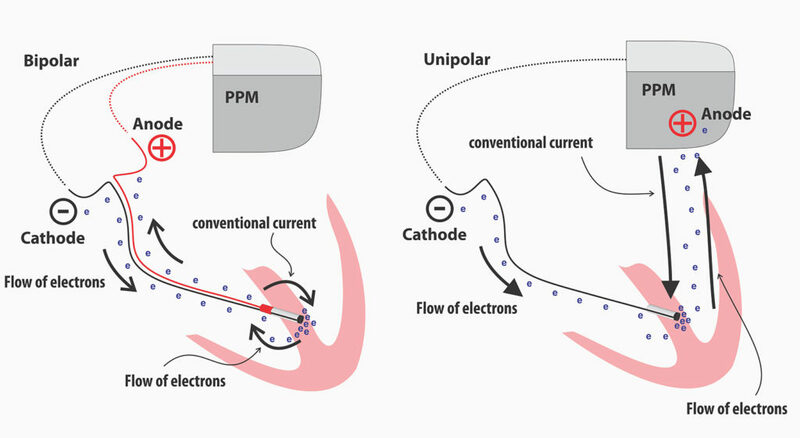 Cathodal stimulation achieves better electron density at the site of stimulation to initiate an action potential. However, the small tip with a high concentration of electrons led to the polarization phenomenon and to counteract that, the tip surface was roughened using porous / woven material which increased the microscopic contact area of the lead tip without increasing its geometric size. Despite this some polarization occurs and leads to after-potentials soon after the initial impulse which if sensed in the pacemaker circuitry, can lead to inhibition of pacing. Post paced blanking events (Ventricular blanked and atrial blanked periods) prevent detection of these after-potentials. Figure : Roughened surface of lead tip. 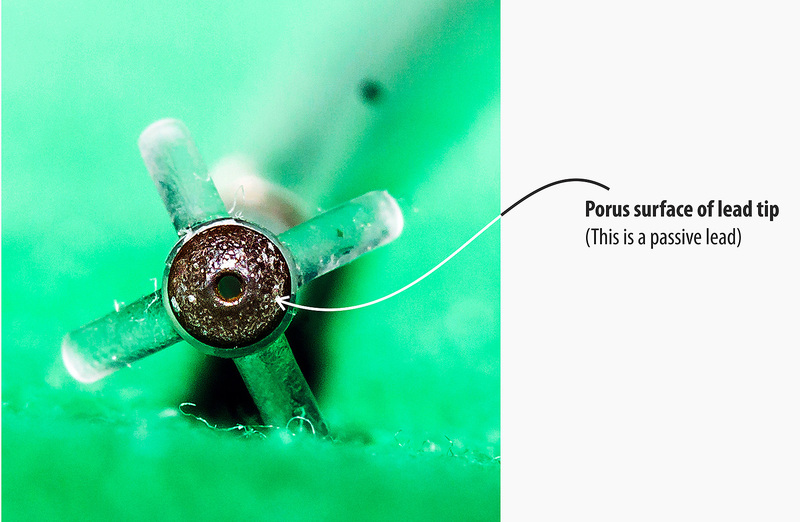 This increases the microscopic contact surface are without increasing the lead tip geometric size. The current density relevant for myocardial capture depends on the lead geometric size but the polarization phenomenon depends on the microscopic contact area. In unipolar systems, the anode was the pacemaker canister (can) and it is in contact with the pectoralis major muscle at the pacemaker pocket floor. To prevent muscle capture, the current density must be low and therefore the anode had to have a large surface area which is automatically achieved as the pacemaker canister was the anode. In bipolar systems, the ring electrode acts as the anode and since there is no issue in muscle capture, the ring electrode has a small geometric surface. (but see anodal stimulation below). Despite large surface, sometimes the current density can increase above the capture threshold of the pectoralis major muscle and cause contractions in the pocket during unipolar pacing – especially when high outputs are used. Early on, it was noted that cathodal stimulation (i.e. 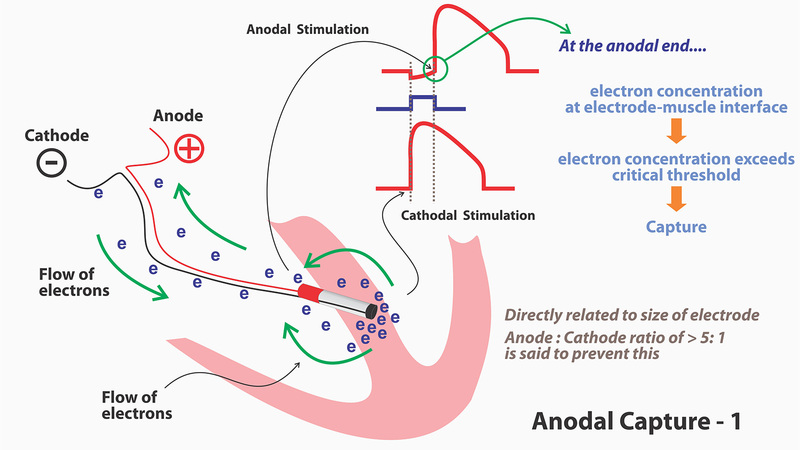 where electrons “enter” the muscle from the electrode) had desirable properties in comparison to anodal stimulation (i.e. capturing the myocardium at the point where electrons from the muscle converge on the electrode). 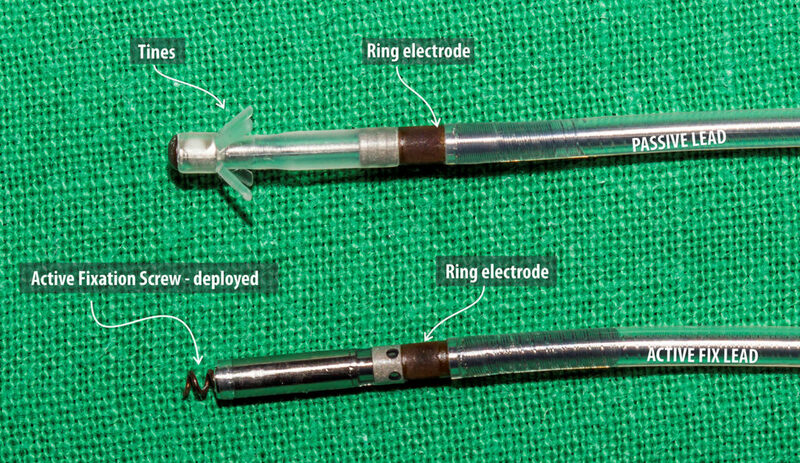 The capture thresholds were low and the electrode corrosion was minimal during cathodal stimulation. It should be noted that during cathodal stimulation, capture occurs at the onset of the impulse (i.e. leading edge) whereas in anodal stimulation, capture occurs at end of the impulse (i.e. trailing edge). Figure : Principle of anodal capture. It was also noted that, during anodal capture, the resulting myocardial refractory period was shorter than for comparable cathodal captures. (This happens because of initial hyper-polarization during electron concentration at the myocardial- anode interface). This raised the theoretical possibility of R-on T pacing as the myocardium recovers rapidly. Certain tests done during 70s and 80 demonstrated that this is indeed possible at fast heart rates in acutely diseased myocardium which led to VT/VF. As anodal capture thresholds are anyway high, it was thought that by increasing the geometric size of the anode could prevent capture by avoiding electron concentration. However in practice this was not the case and anodal capture was seen even at standard pacing outputs (5V, 0.5 ms) despite having large anodes. Figure : The basis of arrhythmogenicity in bipolar pacing. This was initially noted in patients with temporary bi-polar wire but later seen in permanent systems too. However that was nearly three decades ago and with modern leads and synchronous pacing, its is now only a theoretical possibility. 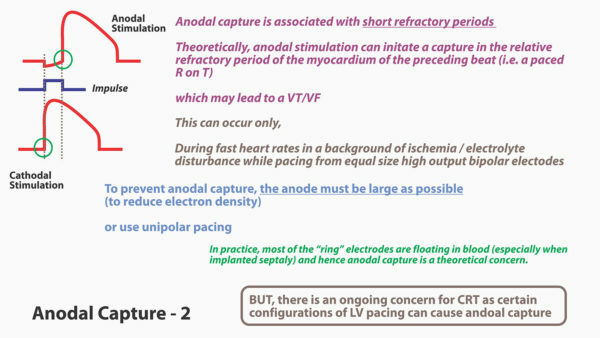 Figure : Anodal Capture in CRT. As depicted three wavefronts can occur in the ventricles. Their occurrence and manifestation depends on the RV-LV timing offsets. 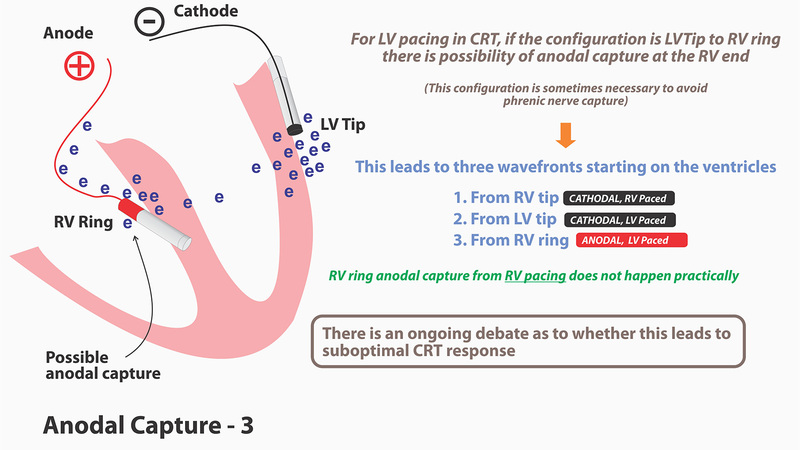 LV first pacing is a common setting and in this situation, anodal capture in the RV ring can actually mimic RV pacing as the wavefront will begin in the RV. Whether this leads to sub-optimal CRT response is being debated. However because of the benefits of modern quaripolar LV leads, the necessity to program RVRing-LV Tip configuration is becoming rare. 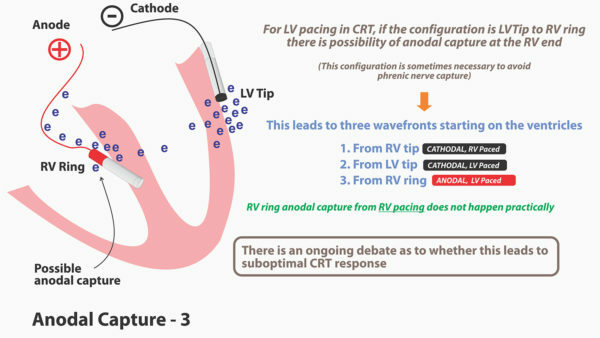 Another possible method of reducing anodal capture in CRT-D is to use an integrated RV lead where the RV shocking coil is the ring electrode and by virtue of its large surface area, anodal capture is unlikely. 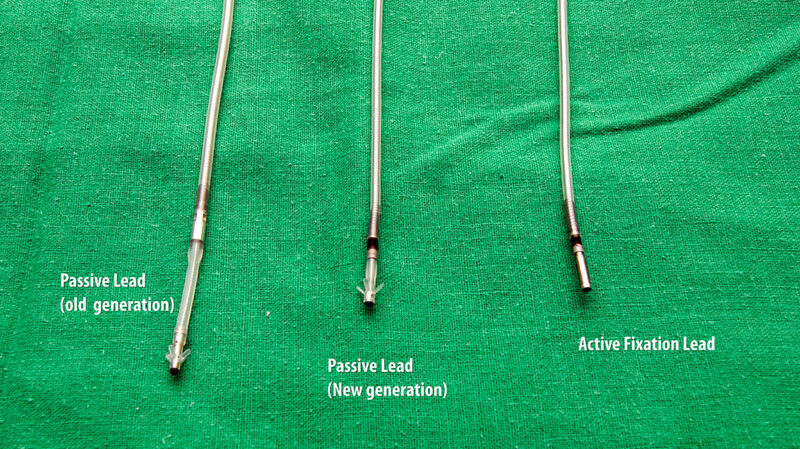 Figure : Comparison of three types of bipolar bradycardia pacing leads – The left side (top) lead is a older generation passive fixation lead. The ring-tip distance is large. 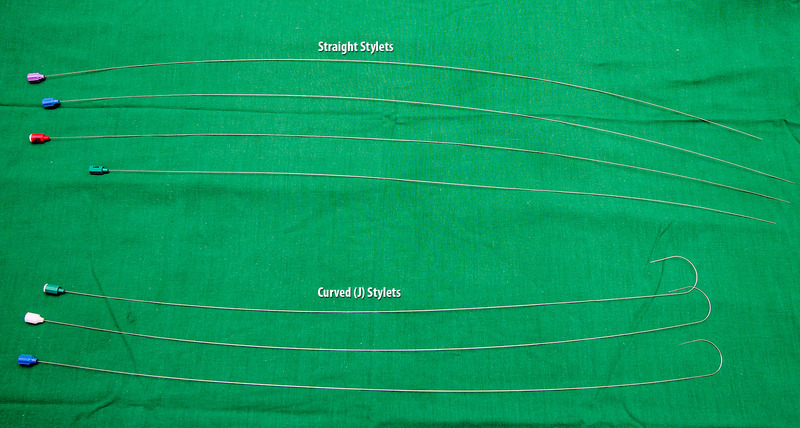 Center lead and right side (bottom) lead are modern leads that represent a smaller distance between the ring and the tip. Earlier leads did not have a lumen for a stylet nor an anchoring mechanism – hence lead dislodgements were common. Subsequently a lumen was built into the lead which enabled a stylet to guide the lead to the desired location (RV apex at that time) – however, it was only when tined (flanged) tips were built, that the lead dislodgements became less as the leads now had a fixation mechanism. These tines were passive fixators – i.e. they depended on anchoring themselves to the RV trabaculae (or RA appendage trabaculae). To overcome this and to facilitate fixation of the lead in any place, active fixation leads with extendable screws were developed and they represent the present day leads. Early on it was noted that after fixation, with time, the lead impedance went up leading to significant battery depletion. This phenomenon is due to inflammation and subsequent fibrosis with scar tissue formation at the tip – muscle interface. Impregnation of a steroid at the lead tip prevented this excessive scarring and helped to maintain chronic lead impedance acceptable, thus preserving battery life. Therefore all modern leads have steroid eluting tips. Majority of bipolar bradycardia pacing leads are made of concentrically (co-axial) placed conducting metal coils embedded in insulating material. Conducting coils are made of metal alloys which gives good tensile strength while maintaining good electrical characteristics. The construction of a coil gives reversible flexibility in all axes while facilitating transmission of torque without twisting the lead body. The insulation is made of a combination of polyurethane, silicone rubber and fluoropolymers (PTFE & ETFE) for optimal flexibility, resistance to abrasion and lubricity to be navigated inside vascular structures. Co-axial nature of the conductor placement gives redundancy for critical pacing: If the external coil fractures or there is an external surface insulation breach, the internal coil (surrounded by its layer of insulation) can continue to pace in the form of a uni-polar lead. All modern pacemakers can electronically detect external conductor errors and switch to uni-polar pacing to maintain rhythm until the lead is replaced. Figure : Lead construction – The leads are made of two concentric coils of conductors embedded in layers of insulation. The concentric nature of the coils give redundancy in pacing as the inner conductor can work as in a uni-polar system if there is a fracture or breech of the external conductor. The lead connects to the device using the lead connector and this connector and connection port design is an international standard (named IS1 pacing connector) which all manufacturers adhere to. This is to provide inter-manufacturer compatibility for lead connections. Figure : IS 1 connector – This is an international standard for connecting bradycardia pacemaker leads to devices.